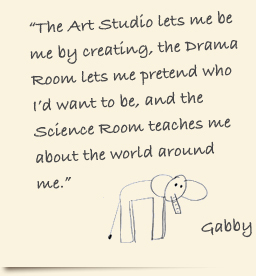 Filled with costumes, props, puzzles and games, the Drama Studio is the perfect backdrop for creative role-play and emotional expression. The room is equipped with a multi-level loft, sandbox and listening centre. The setup of the room encourages imaginative play and peer interaction, which leads to improved literacy, expression, and strong sense of community. The children are encouraged to express their most animated alter ego, through designing and making costumes, writing scripts, and taking part in theatrical performances. The multi-level loft offers a variety of space for small group play, while the sandbox adds a playful and sensory reach element to the Studio. The Drama Room is often considered to be the favourite Studio of Forest Grove students.